Hello! I finished an amazing online mixed media class by Carol Nelson of CarolNelsonFineArt.com. She is a wonderful instructor. Here is a photo of a work in progress I am putting together using some of her techniques. 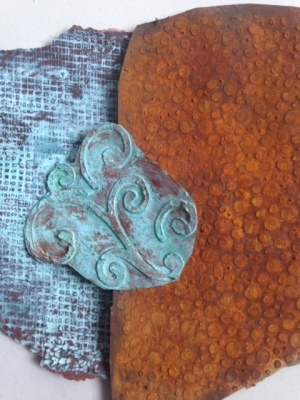 Have you noticed the faux rust paper from my previous post? It will be included in this piece. The really shiny shape in the middle is a piece of mica that I purchased from a local artist. I am looking forward to finishing up this artwork in the next week or so.